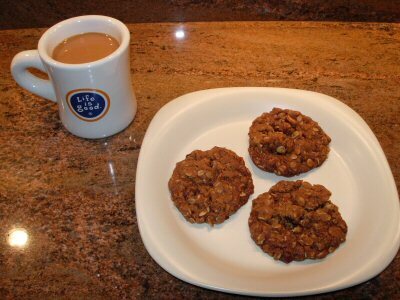 Here at last: the much sought after recipe for the world's best cookie, better known as "Kendra's Kickass Cookies". Everyone who tries these cookies asks for the recipe! In a large bowl, combine softened butter and sucanat, beat well. Separately, combine egg and vanilla, beat until fluffy. Fold egg and vanilla mixture into the butter sugar mixture. Mix well. Combine in a separate bowl the flour, spices, salt and soda. Stir. Add this dry mix to the butter mixture until just combined. Add the oats until just combined. Add the remaining ingredients and mix into cookie dough. Make 1 tbsp. balls, drop onto cookie sheet. Press down lightly on ball to flatten. Bake at 350 for 12 minutes. Allow to cool in pan before moving. Do not stack until room temperature. This recipe was originally developed by MM's daughter Kendra, and tweaked slightly to give a crumbly/crunchy/chewey, almost cake-like consistency, yet light as air, making an already excellent cookie... perfect. This could be a dangerously addictive food, but maybe that wouldn't be all bad, because everything in these little critters is real good for you. the fattest, juiciest, tastiest raisens on the planet. Also used in salads, oatmeal, trail mix. We order by the case! © Copyright 2005, all rights reserved.